Whenever I find myself in my native La Union province (northern Philippines), the first place I visit is the local market to buy foodstuff that I've relished since childhood. The vegies are still as fresh as ever, being sold barely a couple of hours after leaving the farm. But alas, everything is now packed in non-biodegradeable plastic bags, which will eventually clog up our waterways. 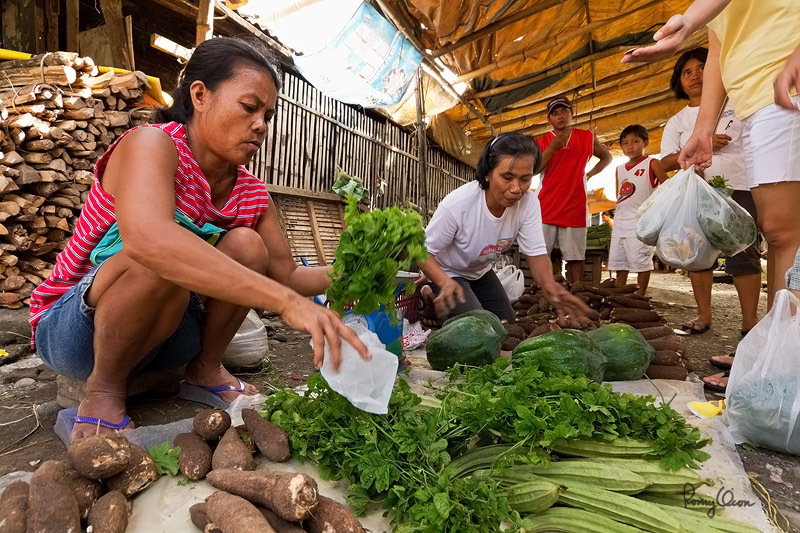 In this snapshot, one buyer is holding a 5 peso coin (USD 0.11) to pay for the bunch of ampalaya leaves (aka bitter gourd plant, sc. name Momordica charantia). These leaves go well with our native recipe of free-range chicken soup, providing a distinctive flavor that we so treasure. Incidentally, the bitter gourd fruit/leaves have been discovered to have amazing medicinal properties, particularly for the treatment of diabetes. Concentrated extracts are now commercially sold in tablets as herbal medicine. For us natives of northern Philippines, we eat this plant for the taste..... the medicinal value is just a newly discovered bonus. Shooting info - Bangar town market, La Union, Philippines, October 16, 2011, 7D + Sigma 10-20, 10 mm, f/7.1, ISO 320, 1/60 sec, hand held, available light, uncropped full frame. so cheap yet so fresh, delicious & healthy. Kumusta kan, kaanakan? Nasiyaat met ta nasarakam daytoy nanumo nga website ko.